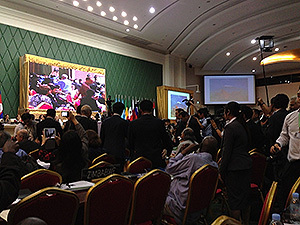 The 37th Session of the World Heritage Committee was held from June 16 to 27 in Phnom Penh, Cambodia (the closing ceremony on the 27th took place in Siem Reap-Angkor). Prior to the session, personnel at the National Research Institute for Cultural Properties, Tokyo analyzed data on the state of conservation of World Heritage properties and data regarding properties nominated for inscription on the World Heritage List. Five representatives from the Institute, including FUTAGAMI Yoko (Department of Art Research, Archives, and Information Systems), attended the session to gather information on World Heritage issues. This session of the World Heritage Committee decided to inscribe 19 properties on the World Heritage List. During discussion of Mt. Fuji, which Japan nominated for inscription, 19 of the 20 Committee Members (excluding Japan) expressed approval of the site for inscription, but many opposed a recommendation to exclude the Miho-no-Matsubara pine grove because of its distance from the mountain. Committee Members gained a full understanding of the value of Mt. Fuji and the Miho-no-Matsubara site thanks to materials such as letters of nomination and explanations from Japanese representatives, leading to inclusion of the Miho-no-Matsubara site. In addition, 6 properties in Syria, such as the Site of Palmyra, were inscribed as World Heritage site of Syria properties on the List of World Heritage in Danger. This was a result of the country’s domestic instability, which has hampered efforts to conserve Syrian cultural properties. However, restoring peace is a complicated issue and will take time. Additionally, the Committee explored reducing the number of properties to discuss and having Committee Members voluntarily withdraw nominations of properties in their own countries during their term of office. However, many Committee Members opposed these proposals, so no decision was reached. The World Heritage Committee does not merely discuss nomination of properties to the World Heritage List as it also plays an important role in dealing with any topic related to the conservation of World Heritage. Representatives from the Institute were involved in varied aspects of the session’s agenda and they gathered, analyzed, and presented relevant information at the session.